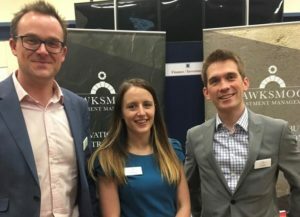 Three members of Hawksmoor’s Exeter office recently attended the annual Careers Convention at Exeter School. Armed with the obligatory boxes of ice-breaker chocolates, Senior Investment Analyst Ian Woolley, Fund Analyst James Clark, and Head of Fund Operations Hannah Isaac talked informally to pupils aged from 15 to 18 about careers in financial services, and investment management in particular. The most popular questions asked by pupils were about what a career in investment management entails, followed by what are the best A2 subjects or degree courses to study, in order to get a job within the industry. All three Hawksmoor staff found the pupils very polite and engaged, which made the evening thoroughly enjoyable.